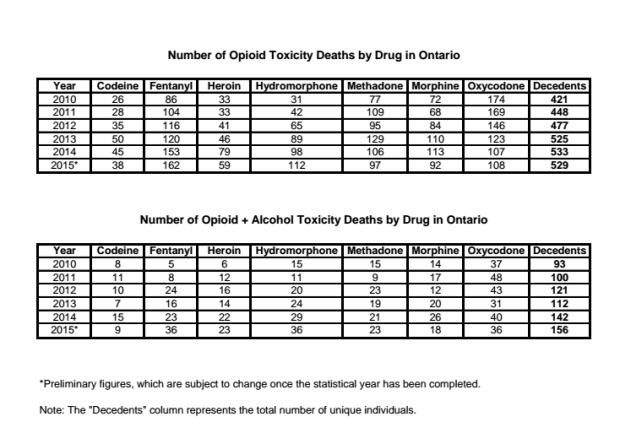 Fentanyl was the number one cause of opioid-related deaths in Ontario for the second straight year in 2015, according to new data from the chief coroner’s office. Across the province, the powerful narcotic drug killed a record 162 people on its own and 36 when combined with alcohol, the new numbers reveal. Over a five-year period, deaths from fentanyl alone have nearly doubled in Ontario, up from 86 in 2010. When mixed with alcohol, the drug killed nearly seven times the number of people who died from combination five years earlier. The figures obtained by CBC News are preliminary but “close enough to the final to be released,” strategic advisor to the chief coroner, Julia Noonan-Savage said. Final figures should be available in 2017, she added. After fentanyl, the second biggest opioid killer in 2015 was hydromorphone. The narcotic painkiller claimed 112 lives and 36 when mixed with alcohol. Hydromorphone deaths have also risen sharply since 2010, when 31 people died from the drug alone. Fentanyl deaths in Canada have been characterized as a country-wide “disaster”. In British Columbia, nearly 500 people died of fentanyl overdoses from January to August of this year. In Ontario, police and community groups have raised alarm bells that a fentanyl crisis could be looming as synthetic versions of the drug appear across the province as they have elsewhere in Canada and the U.S.
Police, community groups and health care providers in the province are now looking to other jurisdictions to see how they’re handling the crisis and to plan ahead. Recreational drug users can often take fentanyl unknowingly as it’s sometimes sold as fake Oxycotin or laced with other drugs like cocaine. The synthetic opioid can be prescribed as pain medication, but is commonly being found in street drugs across Canada. The drug is estimated to be 50 to 80 times more powerful than morphine, according to the U.S. National Institute on Drug Abuse.